The new Racers Edge Solo 80 charger has arrived. 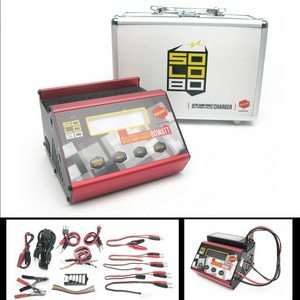 This 80 watt, 6 amp, AC/DC multi-chemistry balance charger is loaded with features and accessories. The Solo 80 will charge 1-6s LiPo/LiFe/LiIon batteries, 1-15 cell NiMh/NiCad batteries and is equipped with a USB port. Accessory charge leads include Tamiya, Traxxas HC, Deans Ultra Plug, Pro Bullet, Alligator clips, Futaba RX, JST and an open lead to solder your choice of connector. All of this is housed in a custom aluminum carry case. Published by Alan Hayes, in Boats, Cars, Helicopters, New In Stock, Planes, Radio Control, Radios.